This department is responsible for the coordination and management of the procedures that allow the workers to get their professional competence officially accredited. By these procedures (PEAC), all the workers who comply with the necessary requirements, will have their professional competence accredited, whatever the way the competence has been acquired. The lists of admitted and excluded applicants to the current procedures are handled by the CPIFP . "Los Enlaces", will be published in the Department News link (Right column). It will also be possible to check these lists in the school notice boards and in the web portal of Agencia de las Calificaciones del Gobierno de Aragón (Aragonese Qualifications Agency). 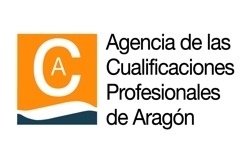 The Agencia de las Calificaciones del Gobierno de Aragón (Aragonese Qualifications Agency) has among its objectives the collaboration with the educational and employment authorities on the establishment of a system of accreditation of the competences acquired along the working life by means not related to Vocational Training, according to the Catálogo Nacional de Cualificaciones Profesionales (National Catalog of Professional Qualifications). To establish this system the Agency has developed an information , counselling and assessment of the profesional competence procedure, both personalised and adaptable, which allows people to capitalise their working experience and their non-regulated training to the effect that their professional competence, that suits their aptitudes, can be accredited, successfully. Addressee: Active workers and unemployed people, with working experience in the field related to the units of competence to be accredited by the procedure and according to each specific call. Responsible: The Aragonese Qualifications Agency in cooperation with the educational and employment authorities. For further information you can browse the Agency website, write an email to agenciacualificacion@aragon.es or call 976 716 961. Need information or guidance more personalized way? Fill out the form or call center to make an appointment. Monday 9:25 h. a 11:10 h.
Tuesday 11:40 h. a 12:30 h.